As a heartlander myself, I don’t usually spend much time in the CBD area. 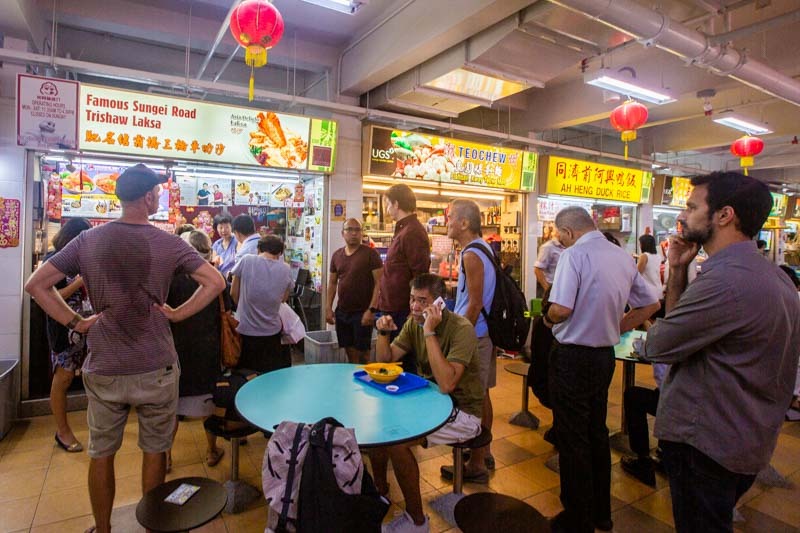 However, after hearing about the abundance of hawker spots there, my foodie senses were tingling. 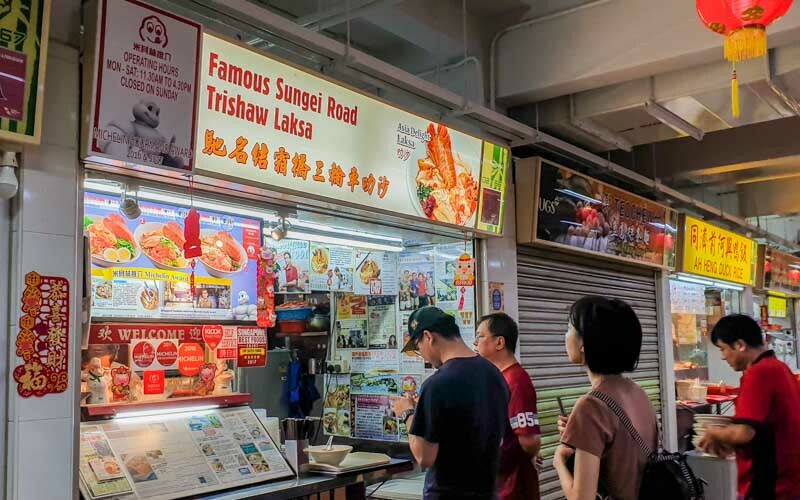 They led me to one of the most popular hawker centres in Chinatown, Hong Lim Market & Food Centre. Many of the stalls in the two-storey building looked promising with their long queues. 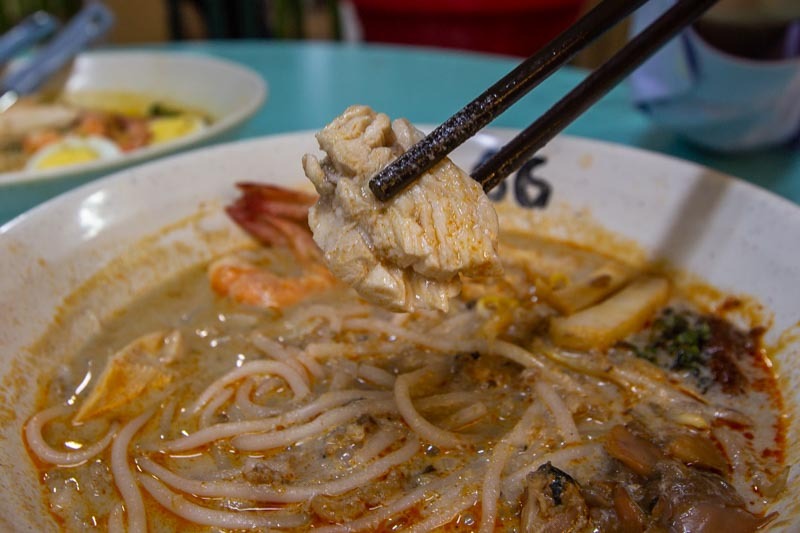 But I was there for perhaps the most well-known of them all, the Famous Sungei Road Trishaw Laksa (馳名結霜橋三輪車叻沙). Since 2016, the stall has received the Michelin Bib Gourmand award every year consecutively. Not only that, it has also earned numerous recognitions from local and international publications alike. All of which was evident from the impressive display of articles all over the stall. It was no surprise that there was a long line during lunchtime. The owner, Mr Soo, runs the stall with his wife. They come to the stall every morning around 7am to start preparing the ingredients. It’s a daily routine that has been taking place since they started the business 19 years ago. Since I was at Famous Sungei Road Trishaw Laksa, I had to get their signature Asia Delight Laksa (S$5 per portion, S$9 with crayfish). 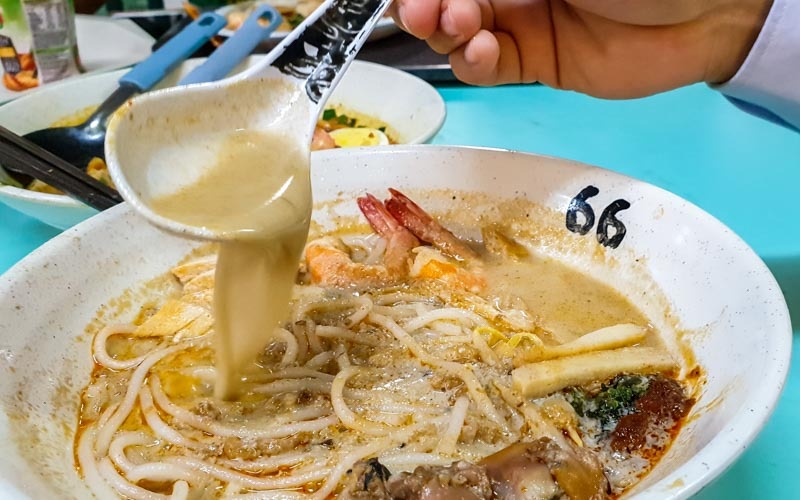 Immediately, I could smell a distinct coconut fragrance from the laksa broth. However, it surprised me that the coconut taste wasn’t as strong as I was anticipating. Instead, there was a very bold umami seafood flavour. It turns out that the owner minces up dried scallops, dried prawns and dried oysters to make the broth. He simmers everything for about two hours before serving it. With so many different kinds of seafood in it, it’s no wonder I couldn’t pinpoint the ingredients at all! Even with only a subtle hint of coconut milk, the broth was still very rich and creamy. It was so addictive that we finished every last drop of it. 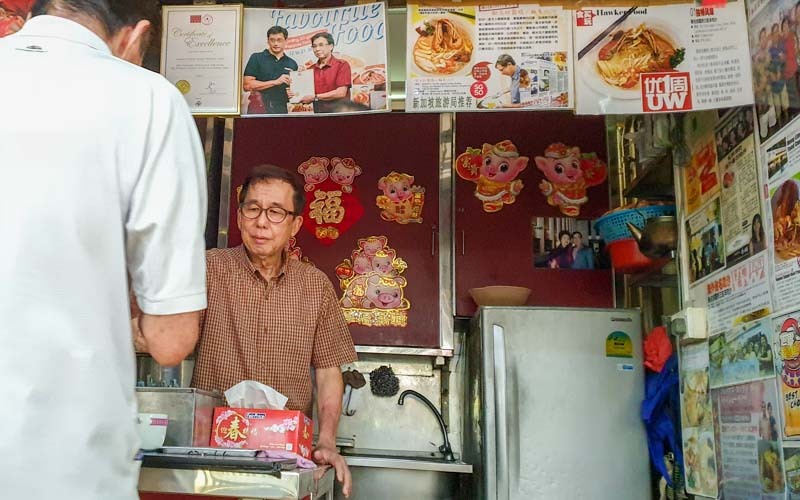 The owner says that this is a Hainanese recipe from the 1950s which he learnt from his teacher. According to him, no one does it this way anymore. 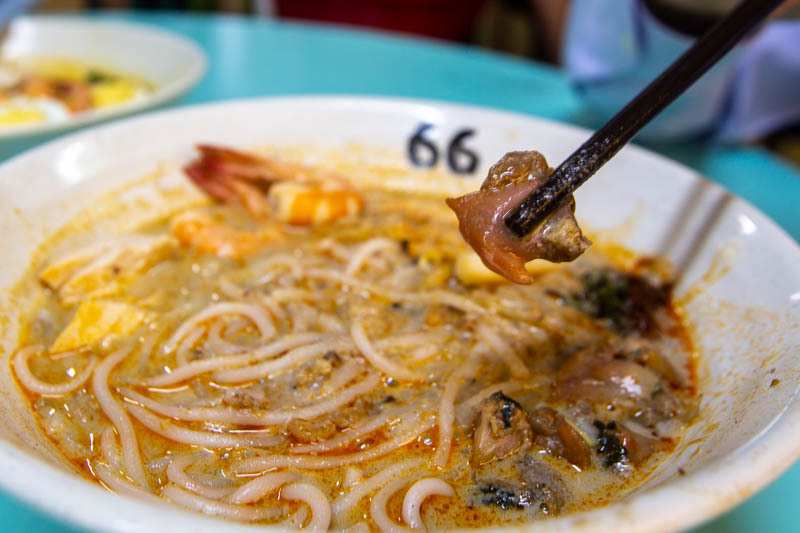 To go with the delicious laksa broth, the owner chose thick vermicelli noodles. We were afraid that they wouldn’t be able to absorb the broth and its flavours. 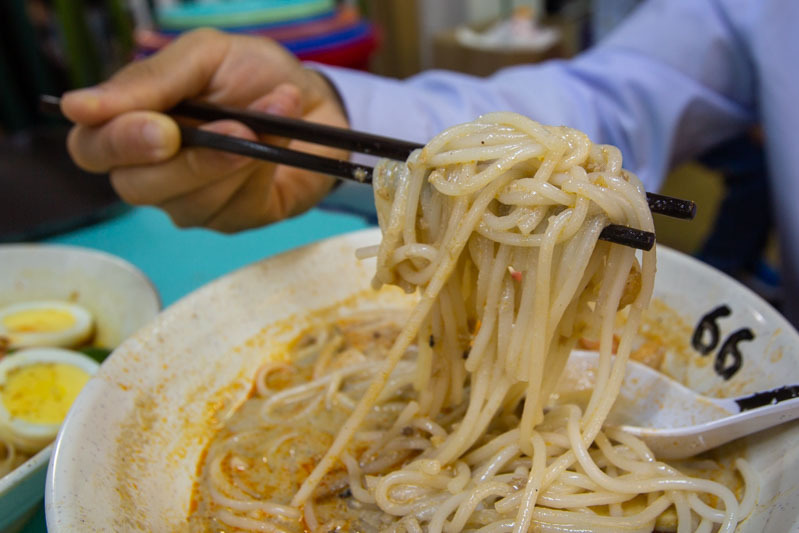 However, the thick noodles surprised us with how much of the broth they soaked up, making every bite simply satisfying. The owner was also very generous with the ingredients in his laksa. We could tell that the prawns were extremely fresh from how cleanly and effortlessly we detached their tails. They were also very succulent and sweet. Not to mention, the cockles were plump and juicy too. We enjoyed how there was a burst of juice in our mouths as we chewed on them. 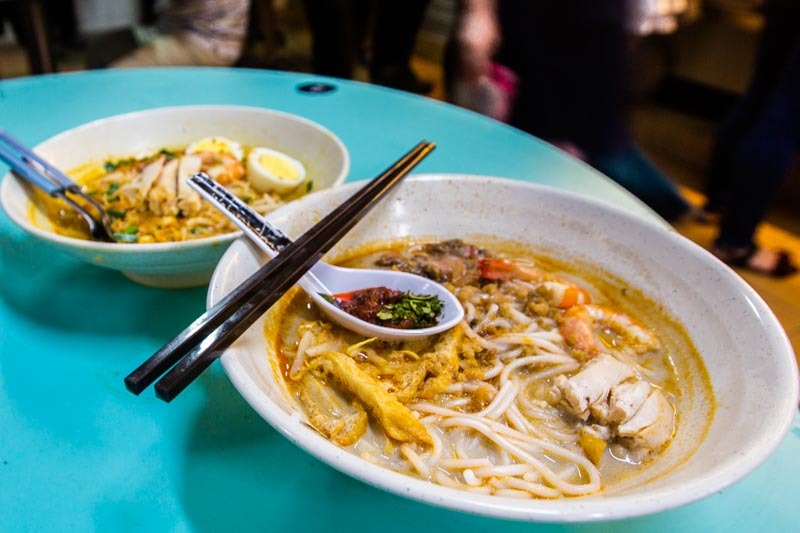 There were also the usual laksa ingredients such as beancurd puffs, beansprouts and fishcakes. However, the huge chunks of chicken meat intrigued us the most. Soft and tender, they were unlike the tough chicken shreds that laksas usually come with. These were able to soak up the broth very well, to our surprise. 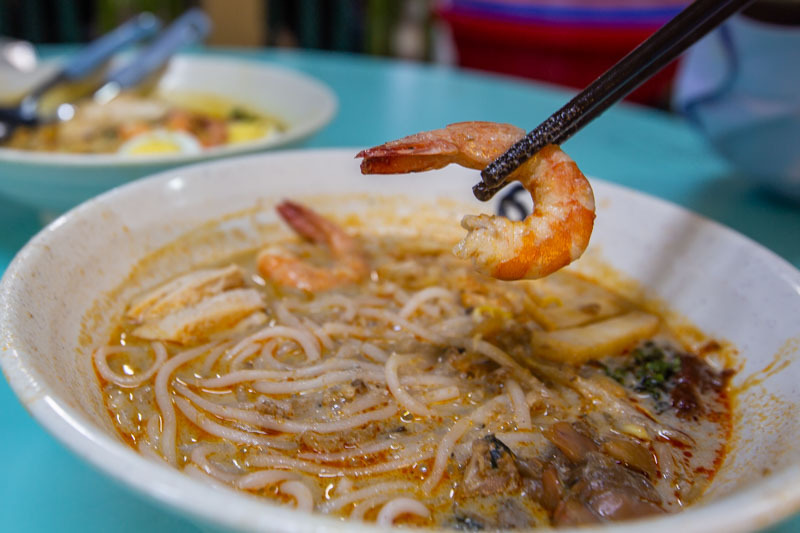 Famous Sungei Road prides themselves on the laksa as their signature dish. But it was actually another dish, the Fruit Juice Mee Siam (S$4 for small, S$5 for large, S$9 with crayfish), that I heard even more about. 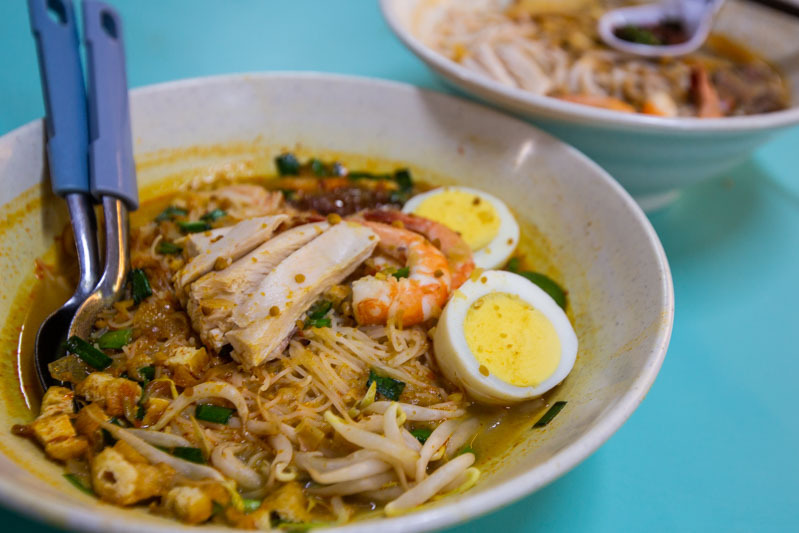 This dish is Mr Soo’s take on a healthier traditional mee siam. As its name suggests, he uses fruit juice to make the broth. I tried to find out more about this one-of-a-kind dish but Mr Soo was totally tight-lipped. He explained that it took him many years to experiment with the recipe before coming up with the perfect one. As such, it’s something very close to his heart and, therefore, a secret. Using our foodie senses, we managed to detect the familiar tanginess of pineapples. We checked with the owner, but that wasn’t it. Nonetheless, the subtle sweetness of the zesty broth made the dish very palatable and had us wanting more. 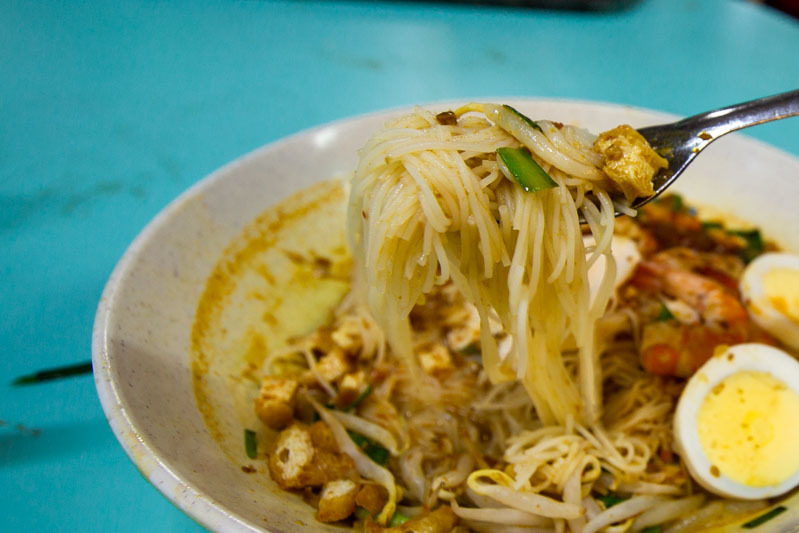 As with traditional mee siams, Mr Soo paired this with thin vermicelli noodles. Therefore, the noodles were able to soak up the acidic flavour of the broth extremely well. There was quite a unique freshness to this dish which made it light and appetising. With the additional nuttiness from the peanuts, it didn’t pack a punch like mee siams usually do. Spice-lovers might find it slightly disappointing, but it was unlike anything I’ve ever had. 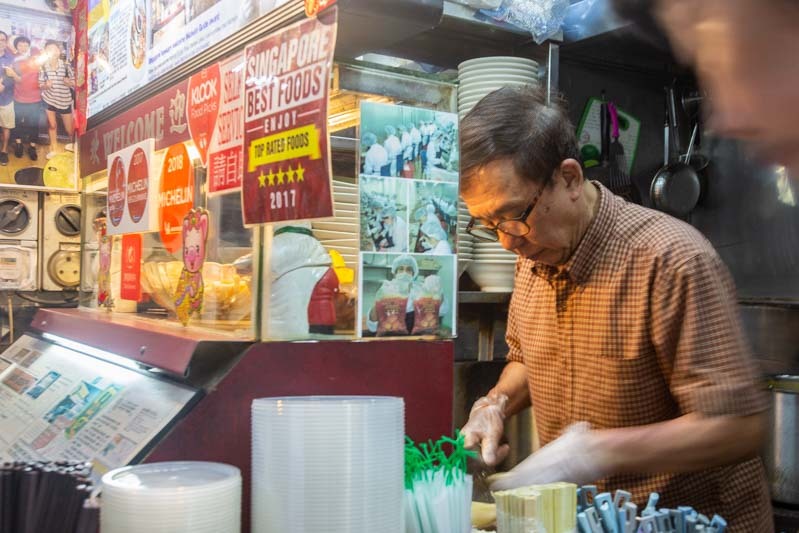 Despite the laborious cooking processes, Mr Soo gets the greatest joy from seeing the smiles on his customers’ faces. He finds the support he has received over the years very motivating and humbling. It was obvious to me that Mr Soo is very passionate about his business. He remembers his customers and also makes an effort to chat with them if the time allows. 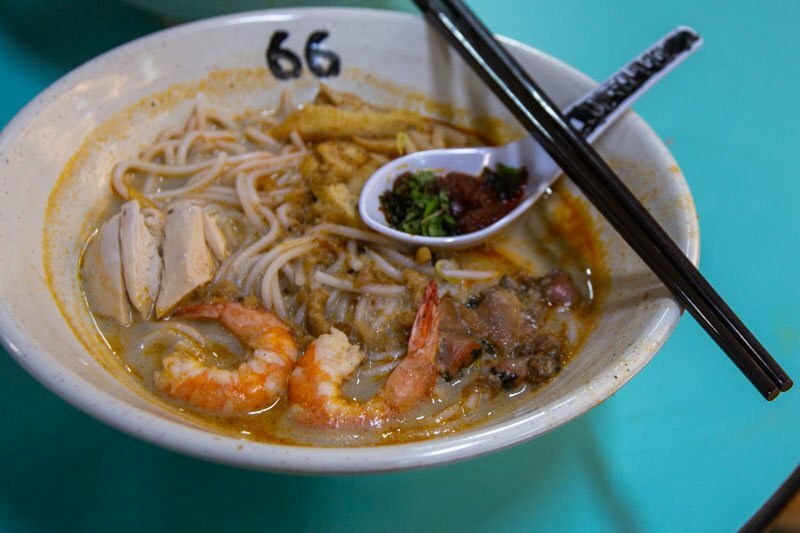 So make sure you say hello the next time you eat at Famous Sungei Road Trishaw Laksa!